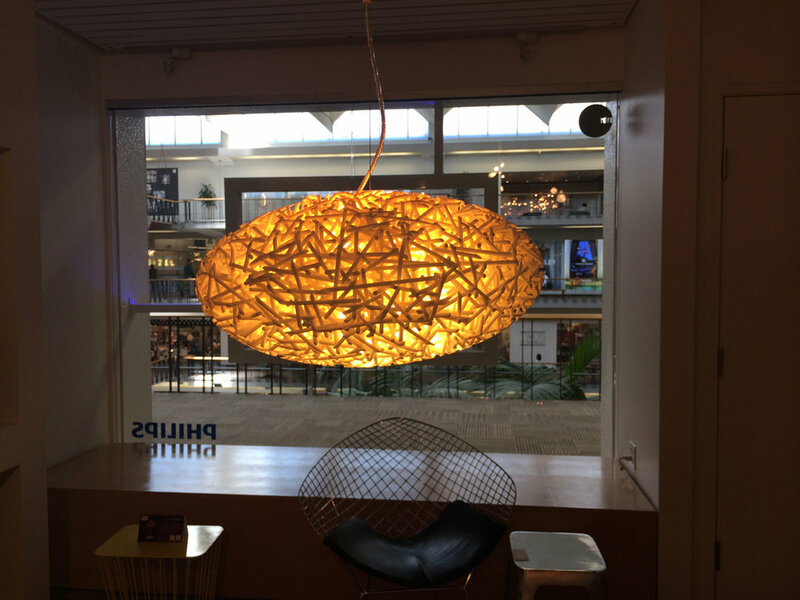 At first glance the Tempest pendant light looked like just another attractive light fixture at the Philips showroom at Dallas Market. It 's beautiful organic nest-like design did, however, draw me to take a closer look. and I found out the fascinating detail, that it was created using 3D printing. Philips co-created this 3D-printed light sculpture named Tempest in cooperation with Danish design duo Strand + Hvass and integrated it into their unique Hue ecosystem. Over 3,000 sticks are intertwined around the Hue light source. Not quite a nest, the Tempest was according to Christina Strand "inspired by shadows you see when the spring sun shines through naked branches.” (Philips) This was translated into a complex design, only possible when 3D printing is combined with Philips Hue. , recreating a captivating scene from nature” The more futuristic fixture of the series, Entity, was created by design team WertelOberfell. The Philips Hue system offers full wi-fi enabled control over brightness, colors (and we are talking about choosing from a palette of over 16 million colors!) straight from your smartphone or tablet. You can set your lights to follow the circadian rhythm: Cooler light that fades in to wake you up and warmer light to fade out at bedtime with any color combination that fits your mood in-between .